With 32 million people, Chongqing is the biggest city in China, equal in population to one Shanghai plus one Beijing. It is 82,000 square kilometers in area, and is very mountainous, like San Francisco. In 1997, Chongqing was separated from Sichuan Province, and became an independent municipality, encompassing the entire Yangtze Valley between Wushan (Lesser Three Gorges) and Chongqing proper. 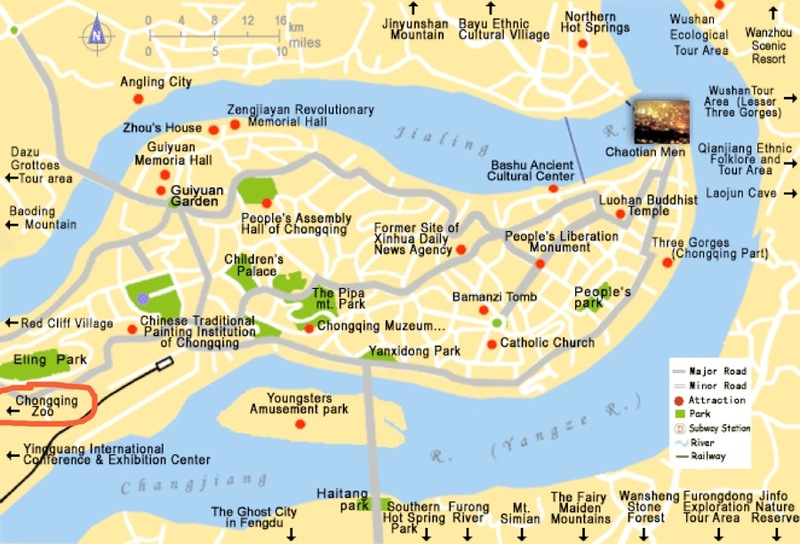 Called Yu for short, Chongqing was established some 3000 years ago at the time of the Ba Kingdom. As an inland port it was opened to foreign trade in 1890 and played a key role in the economy of the southwest region. During World War II, it was the provisional capital of China (1938-1945). The Japanese bombed the city heavily and only the long foggy winters saved the city from worse damage. Chongqing or "Chungking" was known to most of the world as a heavily bombarded yet brave city. Many places of interest here are related to its wartime struggles and or the revolution led by the Communist Party leaders who later took control of China. We arrived in Chongqing after breakfast. We were met at the dock by “stick soldiers” who will carry things for you on bamboo sticks down the long floating pier and up the steep embankment. 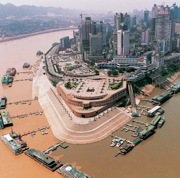 Chongqing, meaning" Repeated Good Luck", is situated at the confluence of the Yangtze and the Jia Ling rivers. It is 3,000 years old, and is said to have been the capital of the Kingdom of Ba during the 12th century BC. The old city is set on a peninsula that rises in tiers against the high, steep slopes of a mountain. The narrow, winding roads that sometimes turn into flights of stairs mean that you rarely see the ubiquitous bicycles of China here. Because most of the foreigners who come to Chongqing are coming to pick up Yangtze River cruise, it is a city that seems to have escaped the modernization of those on the beaten tourist path. For this reason, we will really get to catch some of those rare glimpses of " China as seen through the back door." Greater Chongqing covers an area of approximately 4,000 square miles, and is the largest city in China, with a population of 32 million. About 7.5million people live in the old peninsular city, and the rest live in the surrounding countryside, which was annexed into Chongqing during the 1980's. In April 1997, Chongqing was separated out from Sichuan province, and made a Municipality reporting directly to the central government, as Beijing, Shanghai and Tianjin do already. This " Municipality" is larger than some Chinese provinces (and many countries!). It includes the entire Yangzte River basin between Wushan (Little Three Gorges) and the Chongqing peninsula, with a population more than 30 million. The central government assigned this new entity the responsibility to use Chongqing industrial base to provide jobs and materials for the people displaced by the upper half of the Three Gorges Dam reservoir. A major growth spurt took place here in 1938 when Chiang Kaishek established the Nationalist army's wartime capital here. At that time, entire factories, universities and service facilities were moved here from the eastern coast of China, which was besieged by Japanese forces. Chongqing remained the Nationalistrun wartime capital of China until Chiang Kaishek and his allies retreated to Taiwan after the Communist victory in 1949. Today, Chongqing's economy is based on the manufacture of steel, machinery, power, chemicals and textiles. The bustling harbor is a curious cross between old and new ways. You will see industrial-looking tugboats towing traditional junks piled high with all sorts of merchandise. If you look carefully, you may even see stevedores carrying loads (such as our luggage) carefully balanced on their shoulders with bamboo poles. Chongqing: A tourist indulges in a spa therapy with “doctor fish” in Chongqing, China. The freshwater fish are used for treatment of skin diseases because they eat affected and dead areas of skin. We first drove to the Chongqing zoo to see the pandas. Pandas are native to China, there are only about 1,400 pandas surviving in the wild. They exclusively eat “sword bamboo” shoots, and inhabit small pockets in Sichuan, Gansu, and Shaanxi Provinces. They are solitary animals. 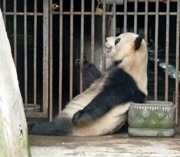 Most of the wild pandas are to the west of Chengdu, very close to the epicenter of last year's earthquake. About 110 giant pandas live in zoos and breeding facilities, with fewer than 20 outside of China. 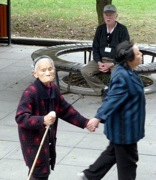 They have thrived at the Beijing Zoo, where they were first successfully bred in captivity in 1963. They have 7 pandas. One of them is 26 years old, and the youngest is 2 years old. There have only been 3 successful babies in the Chongqing zoo in all these 46 years! At birth they weigh 100 grams (.1 kilograms or 4 ounces - about the same as a half-cup of water! ), and full-grown they are 180 kilograms, or 4,000 pounds (2 tons)! Just about everyone is familiar with the panda, but not everyone has had the opportunity to actually see one. On all fours, nose to backside, the adult panda is 4 to 6 feet long and can weigh up to 350 pounds... about the size of the American black bear. 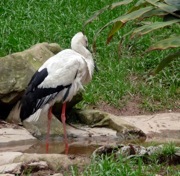 Its coat is thick and woolly, mainly white, but with black markings around the neck, legs, ears. and eyes. It has a stubby tail and the pupils of its eyes are vertical slits, like those of a cat. The panda has unique front paws; one of the wrist bones is enlarged and elongated and is used like a thumb, enabling the panda to grasp and strip leaves from bamboo stalks. Although the panda is quite nearsighted, its senses of smell and hearing are powerful. \The panda does not walk upright as other bears but can stand upright against a wall or tree and it is able to sit in an upright position. The panda's walk is quite bear-like, called the "diagonal walk," with a rolling gait, usually at a leisurely pace. Pandas are rarely seen running and they are not very good at climbing. Although they are not good at climbing, the process of climbing is interesting to watch. They seem to hug the tree and inch themselves up a bit at a time, in caterpillar-like movements. It descends backward, in the same manner. The panda is a very meek, silent animal, capable of making a variety of sounds: bleating, chirping, huffing, snorting and even "barking" when unnerved. It is able to inflict serious wounds if given the chance. The Giant Panda does not hibernate because its bamboo diet does not provide enough fuel for hibernation. The panda is occasionally thought to be of the raccoon family but it is actually a bear. The color contrasts of its coat and that of the raccoon make people think that perhaps they are related. The Lesser Panda (also called the red or common panda) is, however, a member of the raccoon family. The Lesser Panda is only 20 to 24 inches long and weighs only about 7-10 pounds. It is often called a "bear-cat" because of its cat-like appearance. It has a bushy, ringed tail from 11-19 inches long, has a soft coat and is mostly rust-colored with black markings on the face and ears. Some experts have concluded that pandas existed as long ago as 3 million years ago in China's southern tropical and sub-tropical jungles. The word "panda" comes from the country of Nepal, which lies south in the Himalayan Mountains, and means "bamboo eater." Due to the inaccessibility of their habitat, pandas were relatively safe from human predators, until Western expeditions began coming to the wilderness to hunt this strange animal. The first Western hunters to shoot a giant panda were the Roosevelt brothers, Theodore and Kermit, sons of President Theodore Roosevelt. The skin was sent back to the U.S. and was displayed in Chicago's Field Museum, starting a demand for such giant panda mountings. In April of 1972, the Chinese government sent two pandas, a male and a female to the National Zoo in Washington, D.C., where they became perhaps the most well known giant pandas in North America, Ling-Ling and Hsing-Hsing. They were a gift from the People's Republic of China to the people of the United States, presented to President Richard Nixon as a gesture of goodwill when he visited China that year. The giant panda usually lives alone in the dense bamboo and coniferous forests on the mountains, at altitudes of 5,000-12,000 feet where the climate is cool and the area is cloudy most of the time. They were protected because the area they chose was not ideal to most humans so they were left alone. Unfortunately, due to China's being a growing nation with a population over 1.3 billion, needs for wood caused deforestation and this drove the giant panda from its home, down into the deep valleys of the Qinghai-Tibet plateau. The panda is also endangered by its own low reproductive rates. The female panda can conceive only two or three days a year and because it takes at least 18 months to raise her baby, she will reproduce only once every two years. Also, there is an increasing failure to multiply because of close-kin mating within small groups. The Chinese people realize that their prized animal, already rare, was near extinction and by 1949, after the forming of the PRC, the new government put the panda at the top of the endangered list. Giant pandas of both sexes co-exist in areas several miles square. Before mating season, males expand their territories, covering the areas of several females. Some individuals have been tracked in areas up to 80 square miles. Male giant pandas generally do not encroach on each other's territories, except during mating, but females can be combative if another female crosses her area. The mouse-size newborn has pink skin covered with sparse white hair and is blind and toothless, weighing only a few ounces. There may be two cubs, but the mother will focus on only one and let the other one die. The mother assumes full responsibility for the offspring, having chased away or ignored the father right after conception. Soon after birth, the mother picks up the cub and spends time licking it clean, then carries it in her paws or teeth and settles down to nurse. Nursing is important as the infant will not try bamboo for at least a year. Newborns nurse up to 14 hours a day. At about one week old, the cub's hair on its ears and around the eyes and shoulders begins to turn gray. A few more weeks and the legs turn black and black rings around the eyes grow larger and the cub's still-closed eyes start seeing light. Vision is blurry even at several weeks old but start to focus at about three months. The mother takes the infant with her on feeding trips, carrying it in her mouth and depositing the cub nearby. As the cub continues to mature, the mother may leave it alone for as long as two or three days. The baby's first milk tooth appear at two months and has half of its anticipated 42 teeth by about four months of age. It may be practicing chewing on bamboo shoots but mother's milk is still the sole diet. All baby teeth are lost by about 12-14 months and soon replaced by adult teeth. At four to five months, the baby will weigh around 20 pounds and will usually weigh about 60-80 pounds by its first birthday. 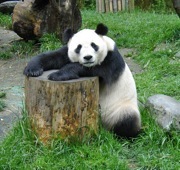 Soon it will start eating bamboo and, by 18 months old, it will weigh about 100 pounds and be ready to live on its own. Actual abandonment of the cub will occur if the mother mates and becomes pregnant again but some cubs have been known to live with their mothers up to two years. Besides the pandas, the Chongqing zoo had some lovely fish, and, of course, the standard zoo denizens. But the best part of the zoo were the children. It was full of school children on outings. They were colorful, very friendly, and joyously raucous. We did a very quick tour of Chongqing, and visited the Stilwell Museum dedicated to “Vinegar Joe” Stilwell, commander of American forces in China, Burma, and India during World War II. We also learned about the “Flying Tigers”,. an American volunteer air group who were based in Chongqing during the war. 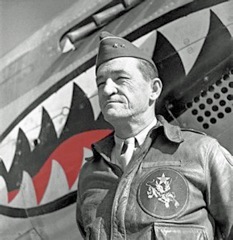 The Flying Tigers did heroic work during WW II, and Stillwell was a great commander, but he was increasingly disappointed and frustrated with the war efforts of Chiang Kai Shek, and urged President Roosevelt to send some of the war materiel to the rebels led by Mao, who were dedicated to fighting the Japanese invaders. Chiang Kai Shek, on the other hand, was much more interested in stamping out the rebels than in fighting the Japanese. Americans have not always waited for their country to enter a war formally to fight for causes they supported, make money, or find adventure. At times, some enlisted with foreign militaries, often forming units composed solely of Americans. During both World War I and the Spanish Civil War Americans formed units to help their allies. The tradition continued during the early days of World War II before the United States officially became a combatant Some Americans joined the Royal Air Force, forming the Eagle Squadrons and fighting alongside English pilots in the Battle of Britain and other early conflicts. But it was another group of Americans, the American Volunteer Group (AVG) in China, that gained the most fame and notoriety in the early months of the war. In 1937, Japan invaded China. The Chinese government looked to the United States for 40 assistance, hiring U.S. Army Air Corps veteran Claire Chennault to train its pilots. 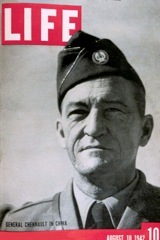 Chennault was a leading developer of combat tactics for pursuit aircraft whose ideas had fallen out of favor. When he was forced to retire in 1937 from the Air Tactical School because of bronchitis, Madame Chiang Kal-Shek, the head of the Chinese Air Force, offered him the job. He accepted and left for China, where his health rapidly improved. Chennault tried to modify the Chinese air force tactics. But the pilots were undisciplined, poorly trained, and considered practicing missions disgraceful. They also refused to take orders from a foreigner. Crashes were common and any pilot who survived training was licensed, regardless of skill. Chennault found himself unable to make a difference. By 1940, the Chinese air force had almost ceased to exist. Many pilots were dead and the already obsolete aircraft had been destroyed. When the Japanese pushed the Chinese government to the western city of Kumming, with only the Burma Road, through the mountains of northern Burma, remaining as a supply route, Madame Chiang sent Chennault home to solicit airplanes and pilots to try to save the country. The Chennault mission was successful for although the country was still neutral, President Franklin Roosevelt wanted to help China, believing it had the potential to become a great democracy. Through the Lend-Lease program, China received Curtiss P-40 Tomahawks powerful lowaltitude fighters. And the government looked the other way as recruiters went onto military y bases, looking for pilots and ground personnel. Many of the recruits of the AVG resembled the undisciplined band of adventurers, barnstormers, and mercenaries that Chennault had feared the project would attract. They lied about their flying experience, claiming pursuit experience when they had flown only bombers and sometimes much less powerful airplanes. The salary lured some--$500 a month plus $400 per confirmed kill bonus--nearly double the average military pilot salary. Some joined to gain combat flying experience, others for the adventure. During the summer of 1941, 300 men posing as tourists and carrying passports that identified them as teachers boarded boats for Asia. The AVG arrived at an English airfield in Rangoon, Burma, and began what Chennault called "kindergarten," learning to fly fast, single-engine fighters. Classes in Asian geography, the history of Japanese-Chinese relations, and pursuit flying tactics adapted to the P-40 in supplemented flight training. By November 1941, the pilots were trained and most of the P-40s had arrived in Asia. 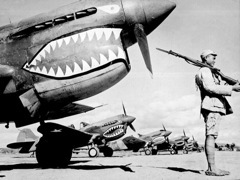 The volunteers adopted shark teeth, which they had seen in a magazine photograph of English P-40s in North Africa, as their squadron symbol, and they painted it on all the AVG planes. The men didn't know that their stateside administrative office had already chosen the nickname "Flying Tigers" for the group and had contracted Walt Disney Studios to design a logo. Although the flyers initially scoffed at the name and logo, they eventually wore it with pride, along with the shark teeth. At the end of their training, the Flying Tigers were divided into three squadrons: the Adam and Eves, the Panda, and the Hell Angels, and assigned to opposite ends of the Burma Road. One rotating squadron was stationed with the RAE in Rangoon and two were sent to Kumming. On December 20,1941, the Kumming units entered their first battle, where they shot down six Japanese planes. On Christmas Day, the Rangoon squadron had its first victories. The victories began adding up, but the small unit was unable to slow the massive Japanese advance. On February 28, 1942, after two days of intensive fighting during which the Pandas claimed 43 victories, Rangoon fell to the Japanese. There were only six airplanes left to evacuate to Kumming; the rest were grounded for lack of spare parts. Then, on March 20, Japan attacked an RAF base in Burma. The attack wiped out the RAE in Burma and the Hell Angels was reduced to four flyable planes. As revenge, Chennault sent ten planes with his best pilots to attack the Japanese air base in Chiang Ma!, Thailand. The mission destroyed more than 30 planes on the ground with a loss of only two P-40s. Combat wasn as easy as the recruiters had promised. The Japanese greatly outnumbered the Flying Tigers. They flew sorties nearly every day, with no replacement pilots and few spare parts for the planes. Many contracted tropical diseases. By March, the men were exhausted. And they began noticing more U.S. army officers in Kunming. The fiercely independent pilots began to worry that the AVG would soon be inducted into the U.S. Army Air Force. None wanted to return to the military with its rules and disciplined lifestyle. Pilots and mechanics began to resign. At the same time, the Flying Tigers were becoming heroes back home. Americans needed to feel they were doing something to avenge Pearl Harbor. Along with Jimmy Doolittle bombing raid on Tokyo, the Flying Tigers became the symbol of U.S. military might in Asia. It was not surprising that the USAAF wanted to absorb the unit when the China-Burma-India Theater was organized under the command of Lieutenant General Joseph StilweIl. Stilwell was already using the AVG for strafing and low-level reconnaissance missions. The missions were useless, but the soldiers on the ground loved to see friendly planes attacking the enemy-But -among the pilots who risked their lives, morale plummeted. -Finally on April 18, Chennault received orders for a bombing mission to Chiang Ma!. The AVG pilots revolted, saying they had joined to fight the Japanese, not to cheer up Allied soldiers. A deal was struck and the mission was aborted, but on May 8, it became irrelevant. The Japanese captured the Burma Road. Supplies for China now had to be flown in from India on a route called "the Hump." With no mission, the AVG began to disband. The Army Air Forces wanted to induct the group into the 14th Air Force. Chennault received a commission in April 1942, and the remaining AVG members were asked to join. Many had already resigned, others wanted to go home, and the navy veterans in the group wanted to serve with the navy, not the army. When the AVG was dissolved into the 23rd Fighter Group on July 4, 1942, only five members remained. The 23rd inherited the name, which it still carries today. It is estimated that 85 percent of the AVG veterans returned to duty with the U.S. armed forces. The American Volunteer Group ended its career with an estimated 300 victories. Chennault stayed in China after the war, running an airline that was sold to the U.S. Central Intelligence Agency after he died in 1958. It became Air America, a covert air force used in the early days of the Vietnam War. In 1991, the Department of Veterans Affairs credited AVG service as time served with the U.S. armed services. The pilots were awarded the Distinguished Flying Cross, and the technicians and staff were given the Bronze Star. After almost half a century, the first Americans to fight the Japanese were finally being recognized. They were mercenaries, gamblers, idealists, bar brawlers, and adventurers: but most importantly, the men of the AVG were patriots. Chongqing: men playing cards In the late afternoon we transferred to the Chongqing airport to take a short flight to Xi'an, where we stayed at the Jinshi International Hotel.